All the facts and figures in one handy place (although we’re still counting the fallen trees). 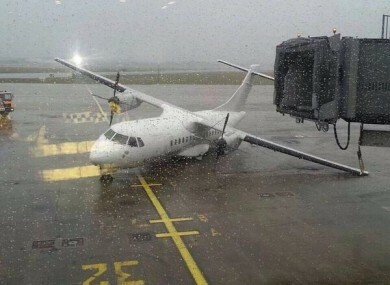 A stationary plane knocked over amid the high winds. THE STORM THAT hit the country on Wednesday seemed pretty terrible — but how bad was it really? Well, pretty bad. Amongst the five worst storms we’ve seen since Met Éireann started keeping records, forecaster Evelyn Cusack told reporters the following day (the weather service is still crunching the numbers on where exactly it sits in that chart). In terms of good news — there were no lives lost. According to the official update from the chairman of the Emergency Coordination Committee on Thursday afternoon, there were “a number of minor injuries” reported, but nothing too serious. ONE: Just one county declared a ‘major emergency’. The announcement was made in Kilkenny on Wednesday evening after the number of calls to emergency services overwhelmed the local response capacity. ANOTHER ‘ONE’: A mini-tornado hit Athleague in Roscommon on Wednesday morning, according to local reports. Met Éireann said it was “not unusual” to see such events in stormy weather. NINE: The number of storms we’ve had in the last two months or so. Although there may yet be a break in the weather next week. TWENTY-SIX: That’s how many years it’s been since we’ve had such a prolonged period of bad weather. “The last time we had so many storms was in 1988,” according to Met Éireann. THIRTY-EIGHT: The number of schools that were closed in Kerry on Thursday as a result of the bad weather. 14 were closed in Clare and 12 in Limerick. FIFTY-TWO: Staff at a nursing home in Killarney evacuated 52 occupants from their facility after its roof was damaged. HUNDREDS to THOUSANDS: Just how many trees met their end at the hands of Darwin? We’re not sure, and we don’t know who’s in charge of counting. 2,000: The number of staff deployed by ESB networks to reconnect customers. 12,000: The level of calls to emergency services doubled from 6,000 to 12,000 on Wednesday. 60,000: Customers left without an Eircom connection at the peak of the storm. 190,000: The number of homes and businesses left without power the morning after. Crews were been drafted in from Northern Ireland to help get customers back online. 260,000: The number of electricity customers cut off at the storm’s height on Wednesday afternoon. Related: So, the storm is gone… Now how do I get to work? Read: Just what is the emergency ‘National Coordination Group’ anyway? Email “Top FIVE since records began, WORST in 26 years... the 12 February storm in numbers ”. Feedback on “Top FIVE since records began, WORST in 26 years... the 12 February storm in numbers ”.